Decoration Kanban is a game that can be played with a team to demonstrate key principles and practices of Lean. It is another variant on Jeff Patton’s Paper Aeroplane game, but with a greater focus on timing metrics to seek out areas of improvement. Great for teams wanting to put theory into practice. Select the style of decoration you would like the team to make, it must be a symmetrical pattern. 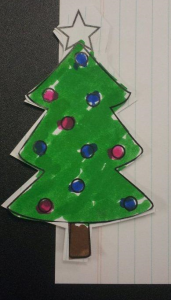 For the activity I used a Xmas tree. 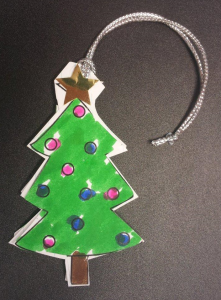 The end product should be a colourful two sided hanging decoration. The facilitator needs to map out the process for the creation of the decoration. Don’t get to hung up on this process as it’s going to change. 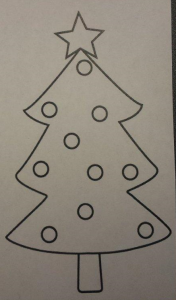 Cut a second tree and glue on the reverse side Using a hole punch put a hole up the top and thread the string through. Important – The facilitator will need to create a decoration completed for each step. Hold up the example decoration and let the participants look at the decoration, touch it and inspect it. Set a timer for 5 mins and ask the participants to start production. Should they ask what the demand is say “just a moment and I’ll find out” wait a minute and announce that demand is 1, wait another 2 mins and announce another 1 is required. The intent here is to replicate the uncertainty of demand. Let the participants start building decorations. At the end of the timer collect all the decorations, and reject any that are not of a suitable quality (needs to be double sided, coloured, cut, hanging loop). Keep the reject ones aside. 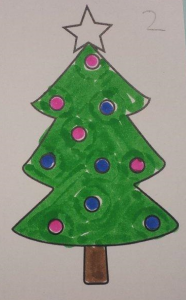 This round is designed to be chaos and it is highly likely that the team will struggle to make a single decoration that is of acceptable quality. The facilitator should highlight all the waste created (look for the Lean Wastes, common ones are Waiting, Overproduction, Inventory and Defects). 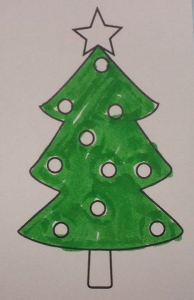 Optional: Apply costs to the input costs, the decoration blanks (2x $100), system cards ($100) and String loops and stickers ($50) for a total cost of $350 per decoration, calculate how much profit was generated if we sold complete decorations for $650 each. Likely to be a negative number. Announce that we are going to implement Lean to help us with our process. This is were you will be using the pre-defined process. Ask participants to be seated around the table, one for each step in your pre-defined process. If there are any extra participants to stand behind a station, they will be our timers. Between each participant place a brightly coloured post-it, and a post-it after the last step. This represents the Kanban squares. Place your previously completed decorations that represent the part completed decoration on the Kanban squares. Explain to the participants that improved productivity is needed and as such we will be using a new process. Explain that the only time that they are to do work is when the Kanban square they feed into is empty. Have the participants get their phones out and set up stop watches, place these next to the Kanban squares. Start the game by taking a (previously) completed decoration from the final Kanban square. This will enact the pull sequence throughout the stations. For the second decoration demanded wait about 10 seconds on a full kanban before pulling again. Once all the Kanban squares are full after the second pull the round ends. Record how long each station process takes in your table. Notice that there is 2 iterations for station 1 and 2 as the decoration is 2 sided. This could be a great segue into Takt time for different processes. Ideas might include adding another station, restructuring the sequence, moving an activity to another station. Put in place the improvements – note that this may mean having to recreate certain parts of the process to ensure they have a full Kanban square before starting. With improvements to the standard process, the bottleneck will move around. Keeping track of the improvements against each round will help the team understand how their changes helped or hindered their productivity. Understanding the steps to create the decoration and visualise the hand-off’s via the use of Kanban squares (Visualising the Work). Discussing what happens when we try to do too much work at once (Limiting WIP). Identifying where the bottlenecks are occurring in the process using metrics (Kaizen). Experiment with alternate ways of doing the work and observing that as we improve, the bottleneck moves around the process (Understanding the Whole). Demonstrating how certain individuals will become more confident with their task and becoming more productive (Managing Specialisation). Using Standard Work to help reveal problems. Decoration Kanban is a game that can be played with a team to demonstrate key principles and practices of Lean. It is another variant on Jeff Patton’s Paper Aeroplane game, but with a greater focus timing metrics to seek out areas of improvement. Great for teams wanting to put theory into practice.